We need to dissolve the yeast first. So dissolve the yeat in warm water and wait for a minute or so..By the time, the yeast will dissolve and becomes frothy. Now add the sugar,salt,oil and milk and mix well. Keep this aside for 10 minutes. Take a large mixing bowl and add the flour. 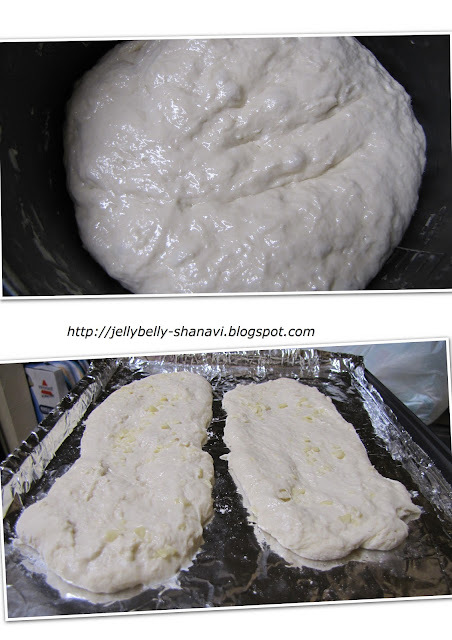 Make a well in the center and add the yeast mixture and the yogurt. Form a dough adding enuf water ..Keep in mind in order to get fluffy and soft naan , the dough has to be bit sticky and thatz wat we r aiming for aswell. Apply oil to this dough and knead well for 3 minutes. Grease the counter / any slab where u gonna make this naan with the flour and start making naan.. U don't have to roll it. Just pat it with ur fingers to a oval shaped naan and tarnsfer this to a cookie sheet lined with aluminum foil..This makes our job easier from clearing the mess..:) .. Or else u may directly make the naan in the cookie sheet and cook it..either way it's fine.. Heat the oven in high broiler mode. This might take some time.. By the time make the naan and sprinkle the chopped garlic and flatten or press it with a spoon so that it sticks with the dough and not falling out. U may prepare two naan per cookie sheet. 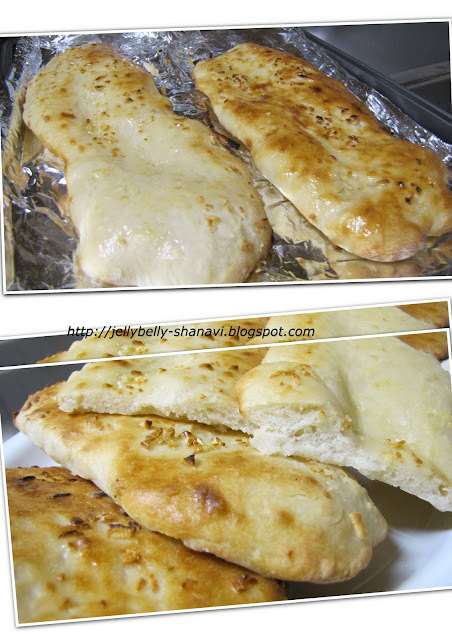 Cook this naan in the oven for 3 to 4 minutes (time totally depends on ur oven ) until u see a brown spot and may be puffed up a little. Now flip the naan and cook the other side for 1 to 3 minutes.. Take the Naan out from the oven and apply the butter spread liberally on the hot naan and serve hot !!!! And thatz a good dinner !!! looks Puffy & fluffy. Will try this method soon. HI Shanavi, Thanks for your comment & support. 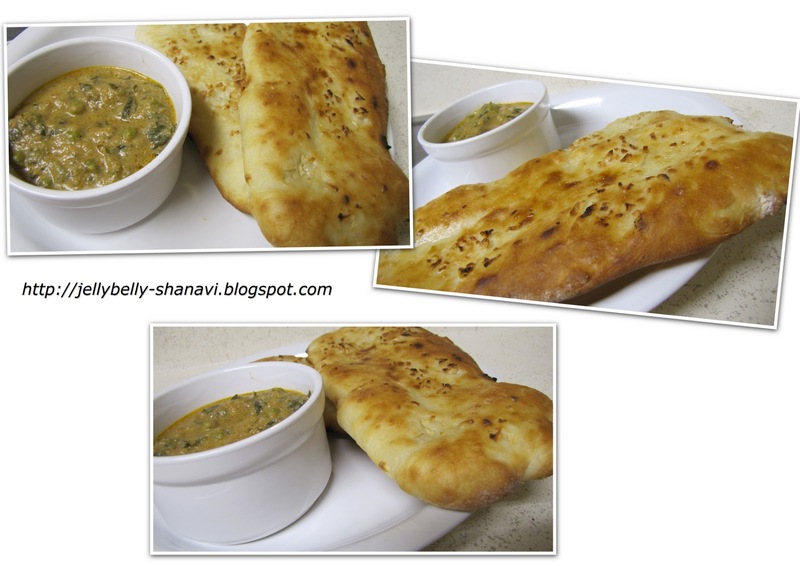 I made paneer butter masala now, i am ready to have that with this naan..Looks super girl!!! Simply delicious naan, they came out wonderful..
Hey Shanavi...thats a great way ofmaking it...totally new to me...and it looks gorgeous as well..
i love garlic nan.. urs looks wonderful. first time here.. like ur space! Thanks dear for trying it out..it does look nice n soft! Wow,looks too good and soft and fluffy! Amazing result! I too have to try once with yeast and the baking version!